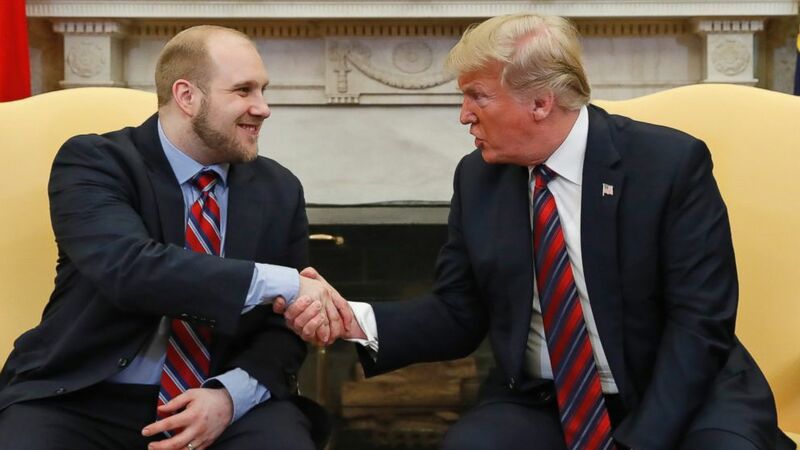 President Donald Trump welcomed American citizen Josh Holt, who was released Saturday morning from prison in Venezuela after two years, to the Oval Office this evening. “They came back from a very tough ordeal in a Venezuelan prison almost two years, Josh, and, you know, amazing that you were able to take it,” Trump said. Holt, who had changed from his blue jeans into a navy blue suit and tie for the White House visit, looked calm and at ease sitting next to Trump. On one gold couch in the Oval Office sat Holt’s family, and on the other couch sat Sen. Orrin Hatch, R-Utah, Rep. Mia Love, R-Utah, Sen. Bob Corker, R-Tenn., and Sen. Mike Lee, R-Utah, in a row. State Department officials lined the back wall of the Oval Office. Sen. Orrin Hatch, R-Utah, left, meets with freed Venezuelan prisoner Josh Holt, right, and his mother, Laurie, in the Oval Office on Saturday, May 26, 2018. “I’m overwhelmed with gratitude,” Holt said. “You’ve been very brave,” Trump replied. Holt had traveled to Venezuela in June 2016 to marry Thamara Caleño, whom he met on an online Mormon dating site. Holt planned to return to the United States with his new wife and two stepchildren, but they never made it back. Venezuelan police raided their apartment and arrested them on charges of terrorism, espionage and illegal possession of weapons. They never received a trial, and maintained their innocence. “We could almost write a book about the past 48 hours,” Corker said. Trump shook hands with Corker’s staffer, who played an instrumental role in setting up communications for Holt’s release. Trump touted the number of prisoners his administration has released and went on to say that he’s specifically looking at trying to free Pastor Andrew Bruson, currently imprisoned in Turkey. “Pastor Brunson, I hope you can hear us, we’ll be helping you,” Trump said. Trump asked everyone sitting with him in the Oval Office to speak about Holt’s release but was surprised — and amused — when Lee turned to Holt’s daughter to address her in Spanish. In this July 13, 2016 file photo, Laurie Holt holds a photograph of her son Josh Holt at her home, in Riverton, Utah. At the end of the spray, Trump said that he wanted to make comments on North Korea.